The Grand Canal is Venice's main artery and primary boulevard, a two-mile ribbon of water plied by hundreds of ferries, gondolas, garbage scows, traghetti, speedboats, and small commercial craft daily. This inverted S-curve of a canal is spanned by just a handful of bridges and lined with more than 200 of the most gorgeous Venetian palazzi (palaces), called home at times by a legion of ex-pats like Wagner, Byron, Robert Browning, Hemingway, Proust, Henry James, Ruskin, and James Fenimore Cooper. The buildings and palaces fronting the Grand Canal range in style from early Byzantine-Romanesque—where pale green, creamy yellow, or blood-red plaster walls are hung with marble sills sporting pointy, eastern style windows—to proportionately precise Renaissance palaces and neoclassical temple-like mansions. Best of all, you don't have to book an expensive gondola ride to do it. Just sit back on the no. 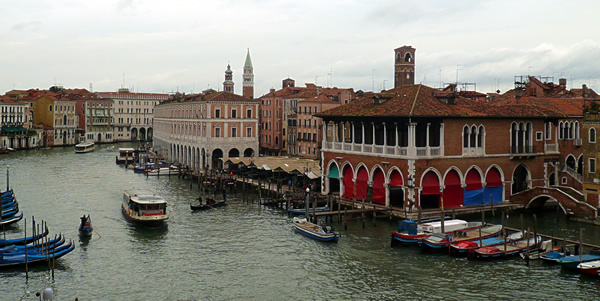 1 (local) or 2 (express) vaporetto line and take an excursion in observation from Piazza San Marco to the Ferrovia Santa Lucia (the train station)—or vice-versa. Don't worry about which palazzo is which. Rather open your eyes and your camera lens to search for the telling Venetian details—an old woman swathed in black leaning out her window; workmen replacing water-rotted wooden mooring piles by pounding in fresh-cut trunks; cats sleeping precariously on open windowsills; churches whose entrances lead up out of the canal, as if only the faithful with boats can attend; and private docks whose ancient marble stairs cling with algae as they disappear under the murky water. In addition to the traghetti gondola skiffs that cross at eight points for €2 a ride (just follow any street called "Callebridges del Traghetto"), there are four to five bridges across the Grand Canal, covered on this page. 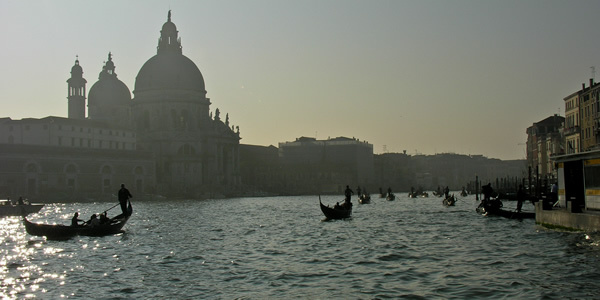 How long does it take to cruise down the Grand Canal? Planning your day: A leisurely vaporetto ride down the Grand Canal from Piazzale Roma to San Marco will take about 30 minutes on the express (line 2 to the San Marco-Vallaresso stop) or 45 minutes on the local (line 1 to the San Marco-S. Zaccaria stop). Between 6:21am and 10pm, there's a boat every 10 minutes, so factor that brief wait into your schedule. Vaporetto boats are open up at the prow with benches, so dash forward to grab an outdoor seat for the best views.